Luke Snyder Music: The Spacer Snare: One of the World's Coolest Drums! The Spacer Snare: One of the World's Coolest Drums! Is it a space ship? Perhaps a laboratory test area? Or wait, maybe its some sort of futuristic robotic fight arena! Actually, its a snare drum. Yes, a snare. More specifically, its a picture from inside the snare drum. The spacer snare is one of the most creative and interesting drum designs of all time. It is an invention of UK based craftsman, musician, and inventor Marcus de Mowbray. According to his website, the spacer snare is in production and full spacer drum sets are available for special order. 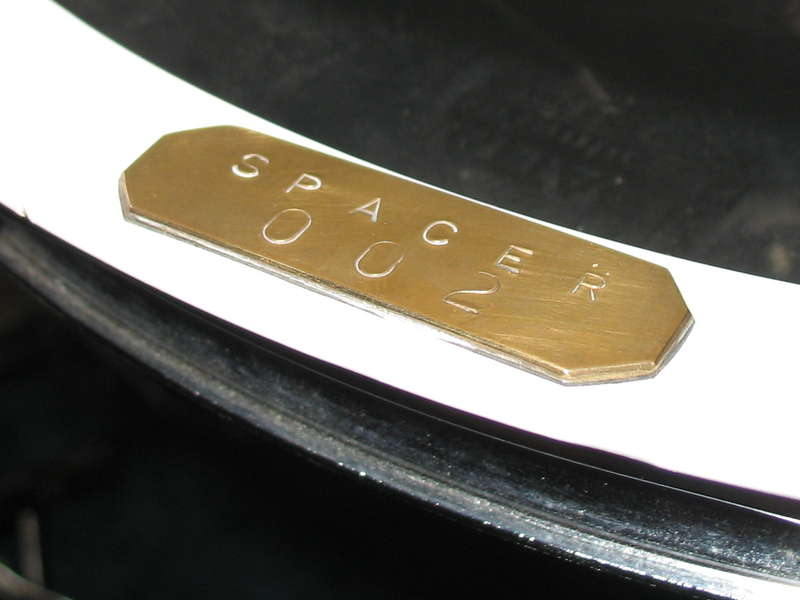 The spacer snare is a highly unique shell-less drum. Instead of a shell, it has two metal rings with bearing edges. The two rings pull together against ten metal spacers, which is presumably the source of the drum's name. These spacers are threaded, and are what the tension rods screw into. The snare takes standard 14" hoops. I purchased my spacer used, and according to its previous owner, I actually now have the very first production spacer snare. You can see in the picture below that it has the serial number 002; Marcus' prototype had serial number 001. Number 002 is the first one that he actually produced! Because of its unique design, the spacer snare has a unique sound. The most defining feature is its volume. It is probably the loudest drum I have ever played or heard. It sounds like a cannon! You'll definitely want to use ear protection with this one (although you should always be doing that anyways!) The other thing you will notice about this drum is that it is a little faster and more crisp when compared to other drums. It responds quickly, then gets out of the way. For this reason, it works particularly well in blast beat situations, or anywhere that there is quick snare work and definition is required. Of course, you want to actually hear the drum! Here are a couple recordings that I have done with it. The first one has been processed, and the second one only has some light compression just to avoid clipping. Both were recorded with an SM57 into ProTools. Enjoy! Hey i found your post on the gk forums. easiest way to find me is youtube.com/bloodshotneo anyways OMG i must have one of these. im loving the sound!!!!! @Matthew Aren't they crazy? Its one of my favorite snare sounds of all time! I want one so bad :( Any idea where I could get one and how much it would cost?